Before returning to more weighty matters and current happenings, a small selection of signage, from the archives. Signage which once informed the people of York in various helpful ways. 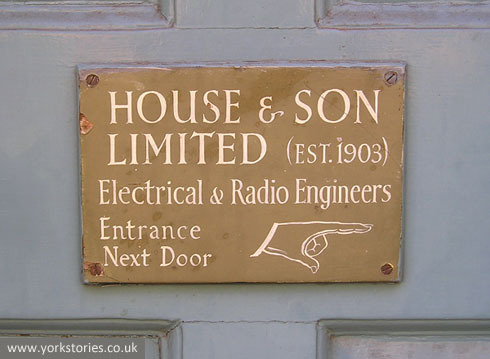 I took this in August 2004, about a month after the local press reported that House and Son (Electrics) on Blake Street were closing down. As the sign indicates, they’d been trading in York for a century. They occupied their Blake Street premises from 1924, having moved from Stonegate. I’m not sure how old the sign on this door was, but they don’t make them like this anymore, sadly. On a side door painted a tasteful, rather faded blue, a pointing hand helpfully indicated where the shop door was. Also pictured in August 2004, and also no longer visible. It was attached to the side wall of a building in Coney Street, the one on the left of the opening leading to the City Screen. 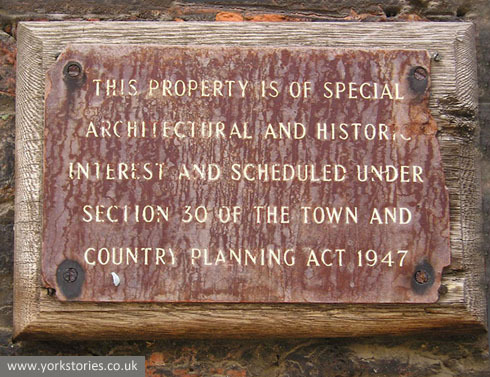 Severely rusted metal attached to a shaped block of wood informed the passerby that the property is ‘of special architectural and historic interest and scheduled under section 30 of the Town and Country Planning Act 1947′. I took the photo because I’d never seen a sign like this before. I’ve never seen one since. Did all listed buildings once have them? I wonder how long it had been there. Possibly since just after the Town and Country Planning Act of 1947. Who knows. Rather mysterious. Even more mysterious now as it’s gone. Maybe it got so rusty in the end that it just fell off. Maybe someone with an interest in signage stole it. Also from 2004, in Clifton, where the fishmongers Cross of York once had a shop. 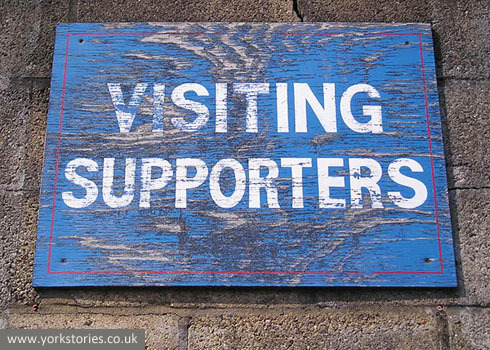 This sign, faded blue and rusty, hung in the archway alongside, over an opening to the back of the premises. I imagine it made a creaking noise on its rusty chain, swinging about on windy autumn evenings. At some point someone probably thought they should take it down before it fell down and caused injury. And in any case, Cross of York aren’t there now. It’s a betting shop. And not far away from the shops at Clifton, the football ground of Bootham Crescent, home of York City football club since the 1930s. Here indicating where the turnstiles for the away end are, with a rather handsome bit of traditional wooden signage on its less than handsome concrete block wall, at the Grosvenor Road end. Photographed in 2004 because of its faded state, which I found rather aesthetically pleasing, and because I suspected that it would be replaced with some of that efficient but far less handsome plastic signage. As indeed it has been. Still on a sporting theme, but moving to a sport less popular these days. 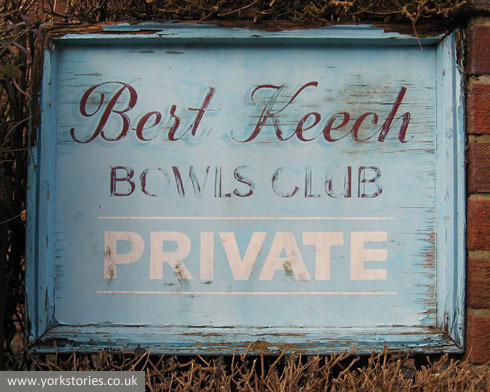 Sign for the Bert Keech Bowls Club, on Sycamore Place, Clifton, shortly before the disused club house was demolished. Faded blue and white on worn brick, one of those nice curved brick corners. A handy image to use as a general illustration, as I have in the past. Taken in July 2007, before the building it was painted on was demolished later that year. It was at the opening of what was for many years the Fishergate Centre, now the site of a hostel built to replace the Peasholme Centre hostel (also demolished). An archway gave vehicle access to a courtyard and buildings behind, and this sign was at the opening. It was built in the days before busy roads full of fast-moving traffic. As I recall you came out of this opening straight onto the corner where Fishergate meets Castle Mills bridge, which would mean pulling out into traffic on a bend without being able to see what you were pulling out into. 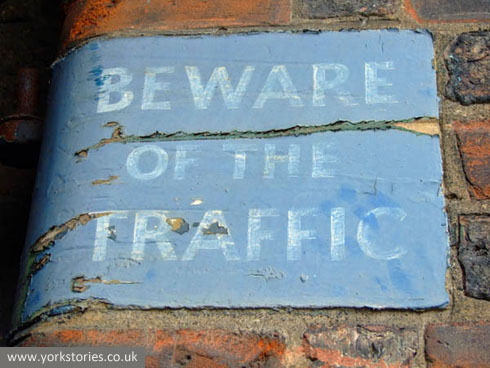 Hence BEWARE OF THE TRAFFIC. And just along the passageway, protected from the elements more than the one at the entrance. 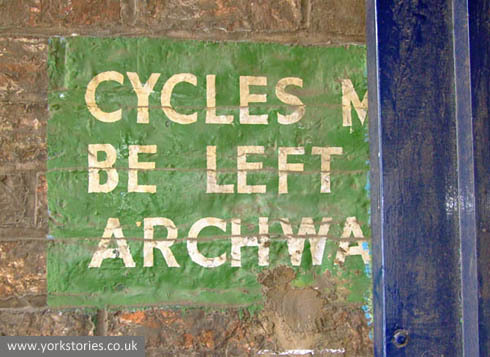 It used to say that cycles must not be left in the passageway, but at some point got cut in half by a gate across. Not that anyone took any notice anyway, probably. Taken in 2007 at the company’s premises on the corner of Garden Place and Carmelite Street, in the Hungate development area. They hung on in there refusing to leave while the rest of the site was cleared. The council were going to use a compulsory purchase order to get this last piece of the land they needed for the planned redevelopment, so I guessed this jaunty sign wouldn’t be brightening that corner for much longer. 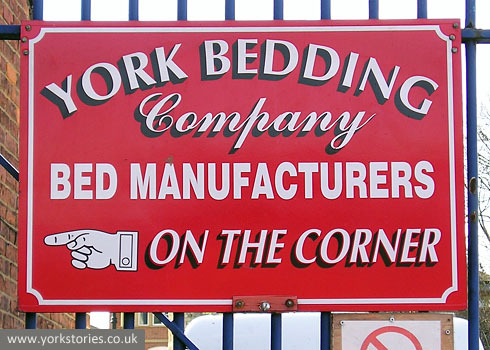 The York Bedding Company continued the ‘pointy hand’ tradition of the House & Son sign at the top of the page, but in a brasher and brighter fashion. End of an era for House-hold name, but the management team formed a new company Yorvik Electrical Contractors Ltd. Number 3 Blake St is now home to the York Cocoa House. 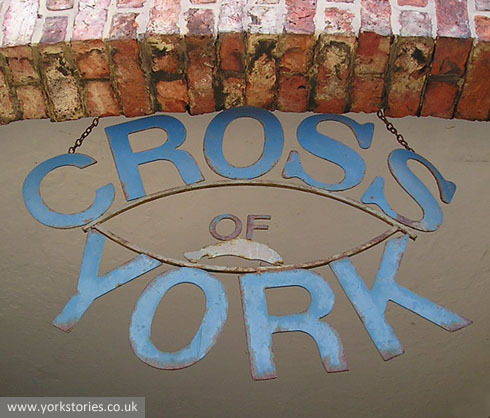 Cross of York can be found still at 3-4 Newgate Market. An earlier page on this site has more information on the Bert Keech bowls club. The services offered by the Fishergate Centre are now available from the York Eco Business Centre, Amy Johnson Way, Clifton Moor. It’s goodnight from beds firm.